Tequila has grown up. No longer a frat house or a blurry vacation cliché, Mexico's national spirit has returned in recent years to its roots, with new premium brands sprouting up that are perfect for sipping and stylish cocktails at home or on holiday. Here are 5 things you might not have known about Tequila – and a great recipe from our friends at Altos Tequila to get you in the 'spirit' for your next trip to Mexico. It all starts with the agave plant. Contrary to myth, agave is not a cactus! It's a desert succulent actually more closely related to lilies. The core is cooked, and the juice distilled into mezcal. Tequila is a specific type of mezcal, with two distinctions: it must be made from the blue agave plant, and in a designated area around the city of Tequila northwest of Guadalajara, and in the highlands (Los Altos) of central Mexico. Tequila is sold around the world as a designation of origin product. Like true 'champagne' is only from Champagne, genuine Tequila must come from its namesake region too. The region responsible for producing the world's Tequila is also one of Mexico's UNESCO World Heritage Sites. The Agave Landscape and Ancient Industrial Facilities of Tequila site is vast – close to 100,000 acres. The area was home nearly 2000 years ago to the Teuchitlan civilization famous for its ball courts, as well as agriculture that led to the cultivation of agave for cloth and the early fermented spirit pulque that set the stage for the distillation of tequila beginning in the 1500's. It's worth a trip to Mexico's highlands and agave farming areas – before or after your beach vacation, or even as a dedicated journey of its own. The village of Tequila was founded in 1530 and has been designated a 'Pueblo Magico' by the Mexican government. Stroll through the village square, and pay a visit to Tequila's 18th century church between distillery tours and tastings. 6-12 years: the time it takes blue agave plants to mature to harvest. 1 life: Agave plants are cut down to harvest the core, so must be replanted for future harvests. 1 Agave core (pina) can weigh a hundred – even hundreds! of pounds when it's harvested. More than 100 distilleries produce more than 600 brands of Tequila, totaling around 60 million gallons (250 million L) every year. 0 worms. The worm-in-the-tequila-bottle myth may have come from a larva that dines on agave plants and ended up in bottles of mescal – but should never be in distilled Tequila. We said Tequila could only be made with blue agave, right? That's true, but it only has to be 51% of a bottle of Tequila. If Tequila is labeled 'Mixtos', it may be up to 49% other types of sugars than blue agave. Tequila purists say only 100% blue agave will do; you be the judge. Blanco (white) or Plata (silver) Tequila is clear and un-aged. Reposado Tequila is aged a minimum of 2 months in oak barrels. 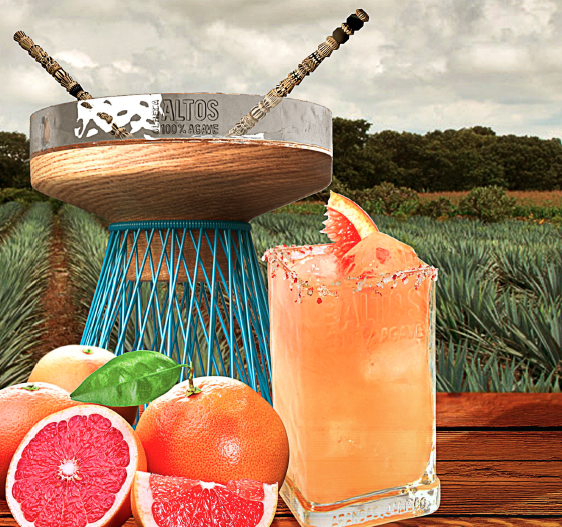 Reposado means 'rested', and this process mellows and smooths the Tequila. Añejo (aged) Tequila is yet more refined, spending 1-3 years in small oak barrels. Extra Añejo Tequila is a premium spirit that has aged over three years, with corresponding increases in price. If you actually need an excuse to celebrate Mexico's national spirit, put these two dates on your calendar. July 24th is National Tequila Day, and February 22nd is National Margarita Day. Would you have guessed the margarita is the world's most famous cocktail? An unbelievable 25% of cocktails sold around the world are margaritas, and Americans are said to drink 4.5 million margaritas every day! But in Mexico itself, 40% of tequila is mixed into Palomas. 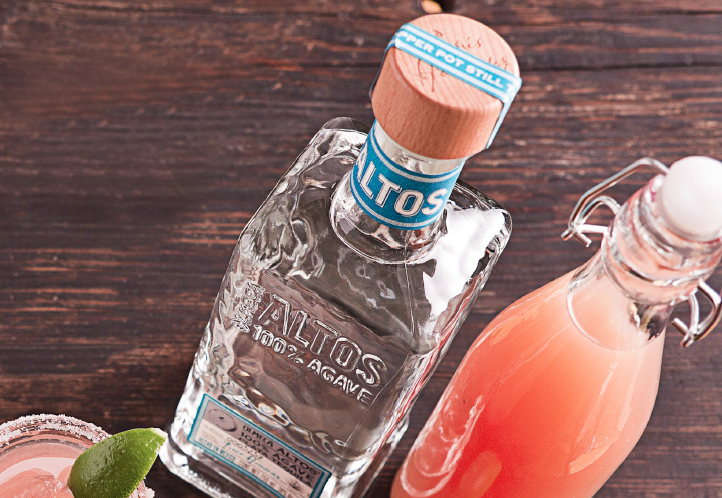 Mexico's most popular tequila cocktail has two versions, and our friends at Altos Tequila have shared their recipes for the Paloma and the Sparkling Paloma. Pour tequila, syrup and lemon juice in a highball glass. Mix to dissolve the agave syrup. Add ice, top with soda. Garnish with a lime wedge. Pour all the ingredients, except the juice, into a glass. Mix to dissolve the agave syrup. Fill the glass with ice and finish with the pink grapefruit juice. Garnish with a half slice of pink grapefruit, and rim glass with salt and smashed pink peppercorns for those without nut allergies. So if you want to drink Tequila like the locals do, mix up one of these cocktails or order one on your next trip to Mexico.